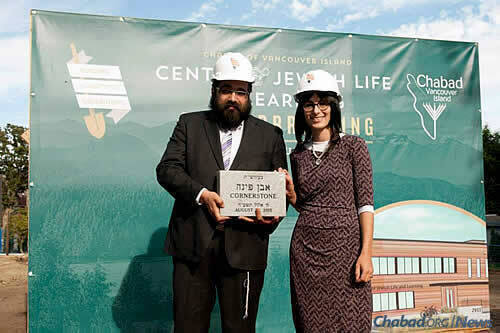 The Chabad Centre for Jewish Life and Learning on Vancouver Island, co-directed by Rabbi Meir and Chani Kaplan, right, celebrates the second season of holidays in a state-of-the-art new building, complete with a brand-new mikvah. 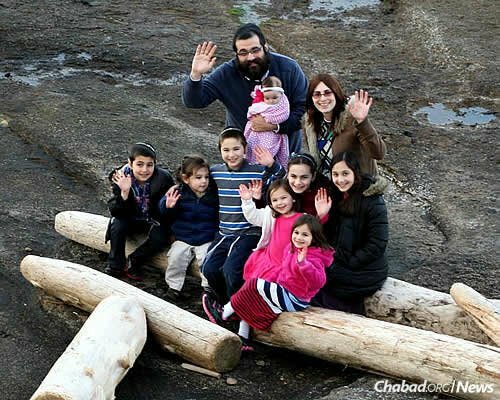 It’s been a year since the doors of a brand-new Jewish center opened on Vancouver Island, the majestic outpost in the northeastern Pacific Ocean tucked off Canada’s coast, north of Seattle. 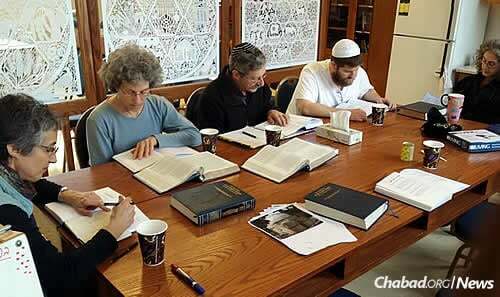 In fact, the Chabad Centre for Jewish Life and Learning represents the first new synagogue there in 150 years. A synagogue, now a historic landmark, was built on the island in 1863, during the height of the gold rush in British Columbia. Known for its mild climate, breathtaking beauty and thriving arts community, Vancouver Island rests beneath a backdrop of distant snowcapped mountains. On its southern tip is Victoria, the capital of British Columbia. From beaches to plentiful parkland, the island is a destination for hiking, biking, camping and surfing. 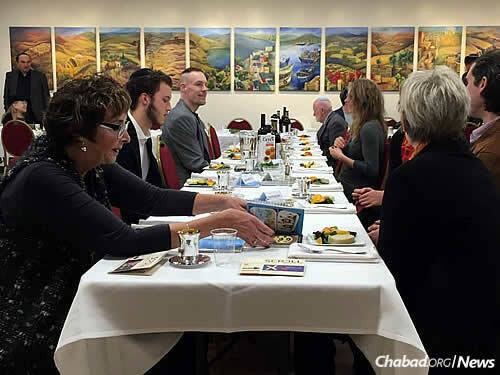 It’s also gained attention for events and programs for Jews of all ages and backgrounds. The large sanctuary represents the first new synagogue on the island since 1863, at the height of the gold rush in British Columbia. While the island itself has a population of about 750,000, about half of them live in and around the municipality of Victoria. Friedman and others estimate that some 1,500 to 2,000 of those residents are Jewish. 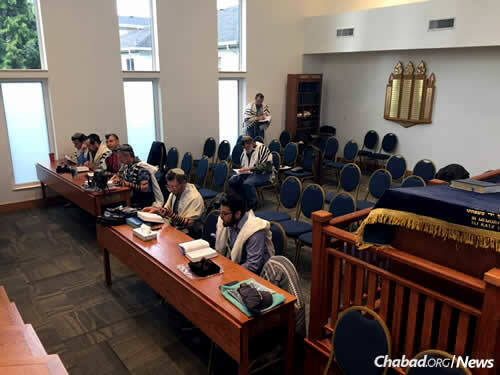 A core of about 50 families frequent Chabad on a regular basis, but on Jewish holidays, hundreds of people attend prayer services and celebrations, as expected during this High Holiday season. 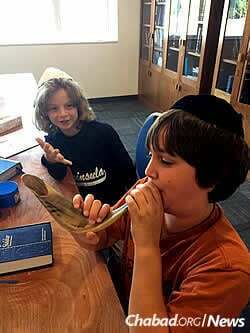 Students on the first day of Hebrew school get ready for Rosh Hashanah. 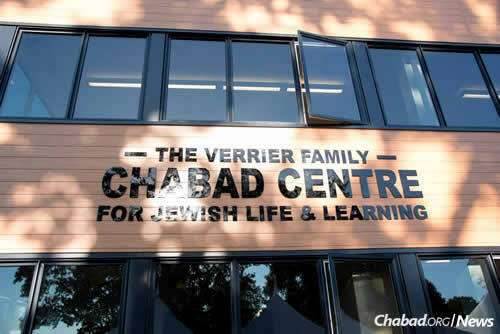 Chabad-Lubavitch emissaries Rabbi Meir and Chani Kaplan settled in Victoria in 2003, where the new 10,000-square-foot Chabad center is now situated. The couple eventually rented a 2,000-square-foot space, which they used for 10 years. But it became clear that they needed a permanent location. The newly built center offers three times the amount of room as their former space. The official grand opening was celebrated last year before the High Holidays, and the community is now preparing for its second year in the state-of-the-art facility. 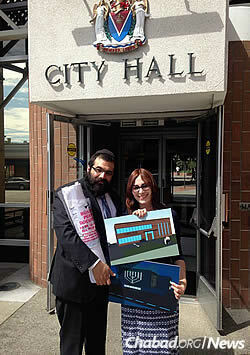 The Kaplans display some of the art for the new building, right in front of City Hall. 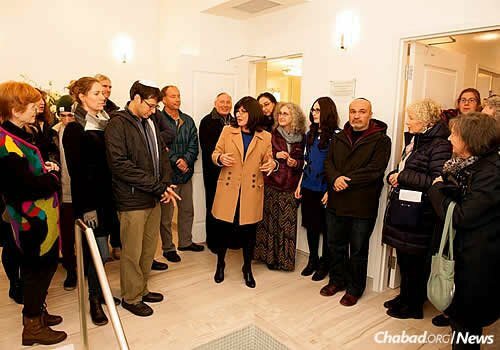 In addition to the synagogue, the new facility includes a mikvah, social hall, day-care center, preschool, library and central fireplace (this is Canada, after all), classroom and office space, and commercial kosher kitchen. Keeping with the artistic flair of the area, decor comes from local artists, including paintings representing the 12 tribes of Israel, a paper-cut glass mechitza, the designed door to the aron kodesh and side-by-side artwork that adorns an entire wall in the community room. A sculpted wash basin was created from a vessel found during excavation. The front door of the synagogue was carved from an area tree that needed to be taken down (then milled on site), rather than discard it. CTeen members gather for a barbecue. 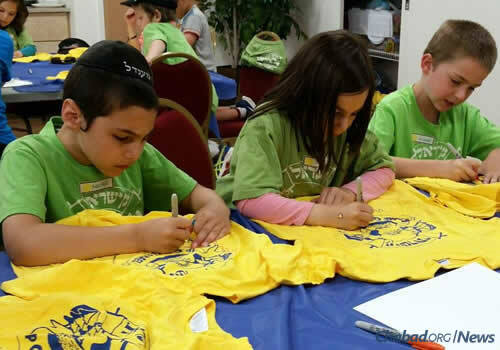 Kids at Camp Gan Israel decorate T-shirts. 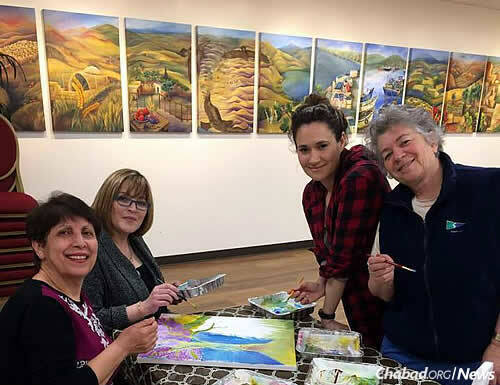 “We could almost liken this to the building of the Mishkan since so many people generously contributed their talents and their treasures to making our Chabad center possible,” says Lindy Shortt, who has lived in Victoria for nearly 35 years with her husband, Shmuel, and their family. 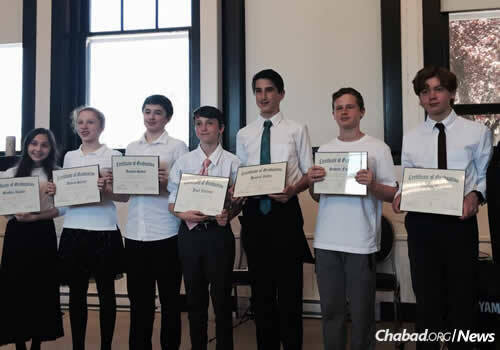 They have been active in the Jewish community all of that time and for the past decade have frequented Chabad of Vancouver Island. At last year’s grand opening, attend by hundreds of community members and guests, she recalls palpable feelings of joy and support. 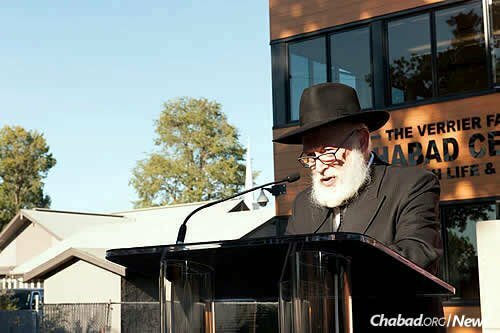 Rabbi Yehuda Krinsky, chairman of Merkos L’Inyonei Chinuch, the educational arm of the Chabad-Lubavitch movement, served as keynote speaker. Located in a quiet neighborhood, the community center sits adjacent to Topaz Park, with its mossy grounds and multi-age-designed playground. On the other age range, adult-education classes and study groups are held weekly, and the occasional art class keeps with the local vibe. 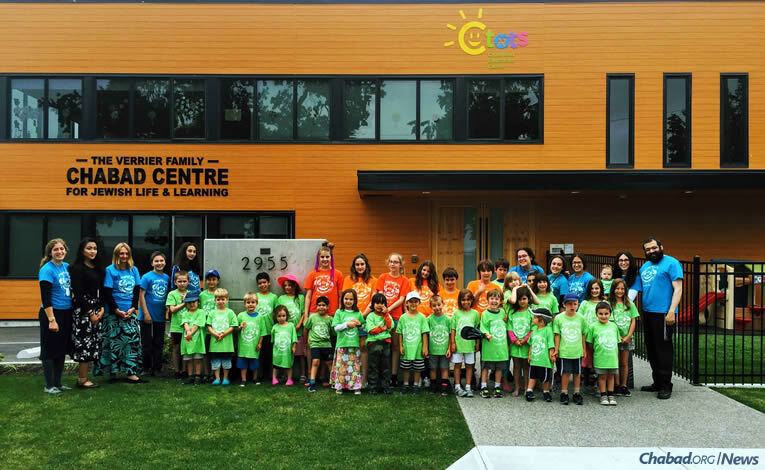 Chani Kaplan runs a growing preschool and Hebrew school, as well as the Gan Israel summer day camp that serves the Vancouver Island community. CTots and CTeen offerings take place in the enormous wood-toned children’s room for the little kids, and for the older ones, sometimes outdoors near the fire pit. Tzedakah, of course, is also a priority. The center prepares and sends meals to those in need in Victoria and beyond. “The Light of Shabbat” project, aided by volunteers and responsible for sending weekly Shabbat food packages to homes on the island, has expanded significantly within the enhanced facility. It’s all part of caring for one another—of continuing existing communal ties and working to make them even stronger. The Kaplans hold the cornerstone of the new building at the groundbreaking ceremony. In addition to the synagogue and mikvah, the building includes a social hall, day-care center, preschool, library, classroom and office space, and a commercial kosher kitchen. 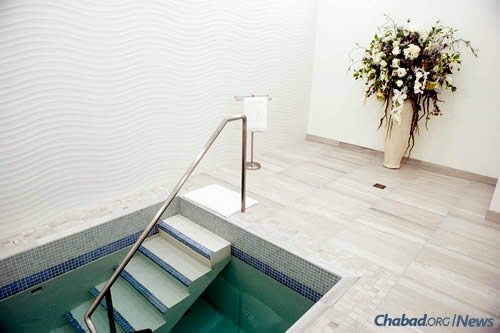 Rabbi Yehuda Krinsky, chairman of Merkos L’Inyonei Chinuch, the educational arm of the Chabad-Lubavitch movement, served as keynote speaker of the 2016 grand opening..
Chani Kaplan gives a tour of the mikvah. Northeast Pacific Coast - Where is that? This is a new one on me! I live in the Pacific "Northwest" and have visited Vancouver Island , BC often. How did Vancouver Island move the "Northeastern"Pacific Coast? 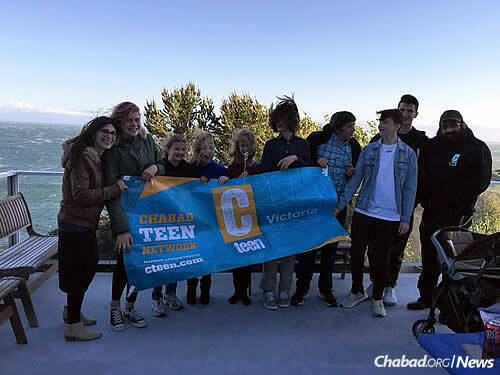 SHABBOS IN VICTORIA Happy accidents do happen!!. A few years ago, my husband and I went to Whisler and decided to visit Victoria a the last minute. Of course it was befor Shabbos and we found a motel not from the school that housed the then CHABAD. Shabbos morning, there was barely a minyum, but the Rabbi went outside in the school yard and found a young man, who was playing ball and encouraged him to make the minyum. I am glad the CHABAD house has evolved and wish them much hatzlacha.